Delicious Parthenon Marbles Cake, stolen from Athens | O'Really? 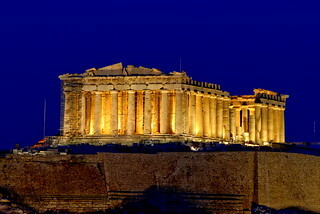 The Parthenon at night by Konstantinos Dafalias, creative commons licensed picture available on Flickr. If you look carefully, you can see the inscription “Elgin woz ‘ere, 1801” where the Marbles were stolen from. Here is a recipe and serving suggestion for delicious Parthenon Marbles cake, originally developed by Thomas Bruce, better known as Lord Elgin. When you have finished vandalising, return to the UK with your souvenir cakes, leaving the leftovers in Greece. These cakes are traditionally enjoyed in London. They are often decorated with large servings of patronising propaganda and a sprinkling of insults against the Greek nation. See for example Elgin Marbles: Relocation Debate on wikipedia and the Parthenon Marbles at the British Museum website. Some people will tell you these cakes are many decades past their best before date. Ignore them if you can, while you enjoy the cakes at a safe distance from any Greeks who will legitimately demand that you return them to Athens immediately. This is a controversial recipe as the ownership of the ingredients is keenly contested [1,2,3,4,5]. Consequently, it may not be possible to enjoy these cakes in the UK for much longer so enjoy them while you can. Trevor Timpson (2012) Stephen Fry’s Parthenon Marbles plea backed in debate vote, BBC News. Trevor Timpson (2012) To sue or not to sue? Parthenon Marbles activists debate, BBC News. Thanks for sharing this, Duncan! Nothing more thoughtful than sharing a classic recipe, it has been used by many, many people in the past. – Once they have arrived in Britain, let them rot in your backyard’s shed or basement (anywhere wet and dark, really – if you can, do that in Scotland where the temperature is a bit lower), and then proceed to the next step. After preparing them, if you reckon they don’t look fresh enough to display them to your friends, try to scrape any dirt off (oh no! it’s not dirt actually, but their own crust!)! Damn!